We don’t have any sort of big arctic blast on the way, but a much cooler feel to our daily life here in the metro area. November & December have been very mild. In fact we’re likely to see December 2012 go down as the warmest December since 1999. A colder air mass has pushed through the Columbia River Gorge and into the metro area this evening. It’ll be over us and turn a bit colder next week. High temperatures will only be 40-45 even with sunshine (that sun begins Sunday) tomorrow through next week. Low temperatures in calm parts of the metro area will drop as low as the upper teens and lower 20s beginning New Year’s morning. Everyone will finally have a hard freeze. Cold east winds will be around for a long period, Monday through Friday next week at least. The bonus? Little to no rain in the next 7-10 days and ample sunshine. The Coast and foothills/mountains will not be unusually cold, quite a bit of sun in those areas too. 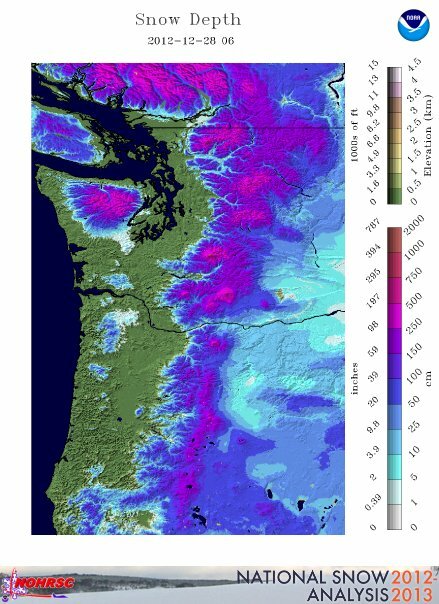 It doesn’t show the very lowest elevations east of the Cascades as snow-free (they are), such as The Dalles and areas right along the Columbia River, but there is definitely snow cover across just about the entire rest of the Columbia Basin. Snow cover is very good at reflecting the warming rays of the sun, and allows rapid overnight cooling under clear skies. That’s a setup for a pool of cold air to form and stay trapped in the lowest 3-4,000′ of the atmosphere east of the Cascades the next few days. A bit cooler than we have seen in previous east wind events the past few years. It’ll happen because we are now in “split-flow” over the West Coast as very weak upper-level systems fall apart as they move towards us. With no stronger systems to mix out the cold air, it’ll stay put. Cold air is dense and heavy, so pressures rise eastside. 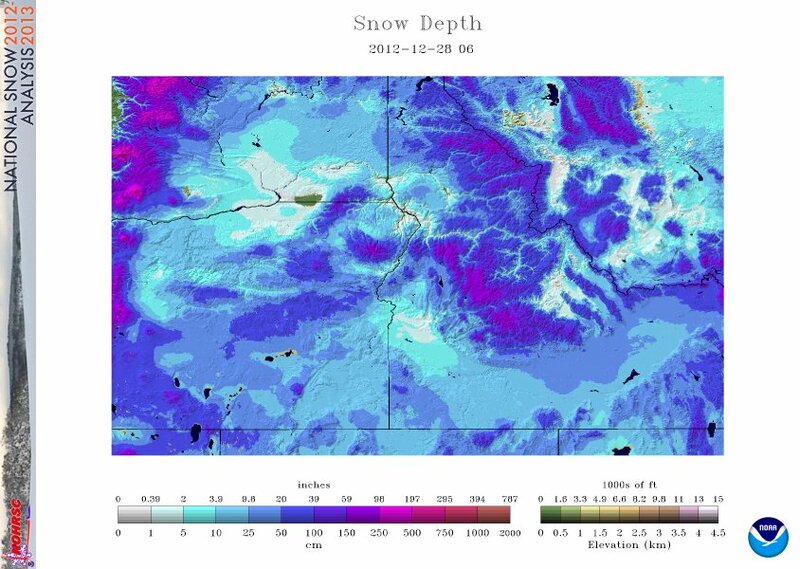 There’s no place for the cold air to move except through gaps in the Cascades below 3,000′. The only one lower than that between British Columbia and California is the Columbia River Gorge. Thus a cold east wind blows through the Gorge and accelerates down the western end. This evening the effect of the cooler east wind and drier/colder air mass has shown up in several ways. It’s ten degrees colder at Biddle Butte just across from Vista House at 1400′. Last night it was 36 at that spot at 9pm, tonight it’s 26. That’s not because of calm and clear conditions either since the wind is blowing hard up there. Ausperger Mtn (3,000′) east of Carson is 10 degrees colder at 9pm as well. 31 last night but 21 tonight! Dewpoints have taken a dramatic tumble in the metro area too. PDX is 28 right now, it was 37-39 at the same time last night. Much drier air is now over us and will stay here through next week. A weak system comes down from the northwest tomorrow afternoon, but at best it’ll produce a few sprinkles. Another one attempts to move into the ridge and splits apart late next Wednesday or Thursday. The 00z GFS and 00z GEM both show it producing precipitation (rain or freezing rain most likely) at that time. We’ll see. Future runs may show it just dry. I expect clearing, dry air, and not too strong of an east wind away from the Gorge next week. This is the perfect setup for much colder overnight temps. I could easily see the 18-22 degree range at Hillsboro and Scappoose. Even PDX could get well down into the 20s if the wind backs off at that location at night. For those of you in the west end of the Gorge, fire up the wood stoves! Looks like a long period of strong east wind and very cold temps. Highs only in the 30-35 degree range much of next week in the windy areas. You are currently browsing the FOX 12 Weather Blog blog archives for the day Friday, December 28th, 2012.